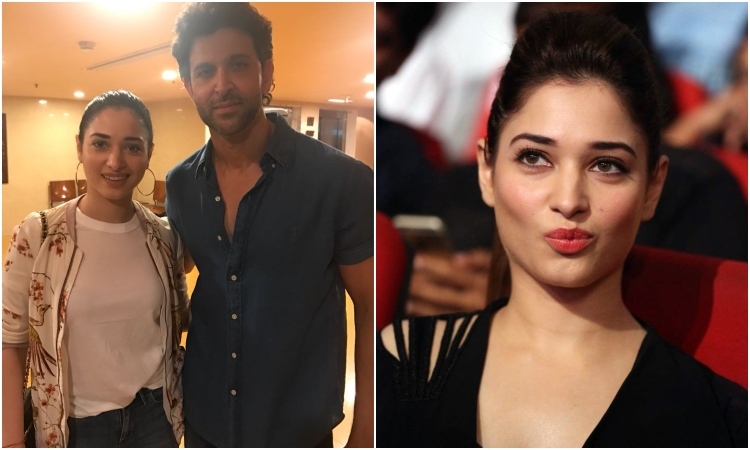 In an episode of chat show "Famously Filmfare" (Tamil), Tamannaah said that if she ever gets a chance to work with Hrithik, she is ready to bend the rule for him. "I don't kiss on-screen basically. So that's actually a part of my contract. But I keep joking with my friends, with Hrithik Roshan, yay! I would, I would," she said as she blushed away. The "Baahubali: The Beginning" actress also recalled her first meeting with Hrithik. She said: "I am a huge Hrithik Roshan fan. I recently bumped into him and I was so stupid. I was like 'Hi, I am a big fan and so nice to meet you' and then I was like okay I didn't know what else to say. And then he walked a little and looked back. He was like, 'You want a picture?' and I was like 'Yes! I want a picture. Be it the Telugu film industry or Tamil or Kannada, Tamannaah has featured in several southern films. She is currently gearing up for the release of the Telugu remake of Kangana Ranaut's "Queen".